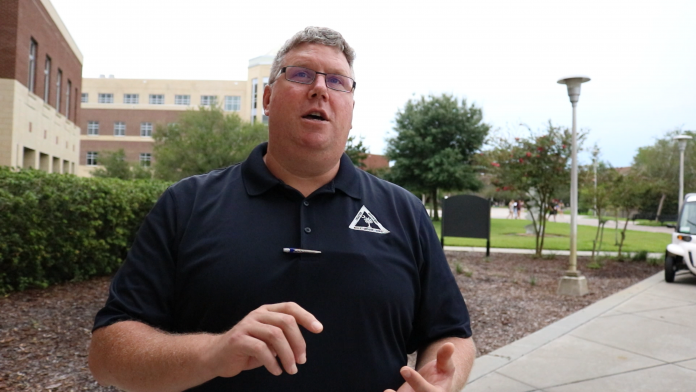 University of Central Florida Professor of Environmental Science & Public Administration – and hurricane expert – Christopher Emrich interviewed with Knight News Wednesday on the impact of Irma on Central Florida. Update: University of Central Florida to remain closed through Tuesday. What impact would a hurricane like Irma on an inland city, such as Orlando, and a coast city, such as Miami? I think, fortunately, the path of the storm means an impact in Orlando is much less than it could have been – we should still expect to see category 1 force winds here. As compared to a city like Miami, they will see storm surges because that front-right quadrant will push that storm surge directly into the shore. We’re much better off being in the center of the state. What can we expect as Texas recovers in terms of transportation, communication, shelter and more, using trend data from previous major disasters? I think what we should expect to see, and what everyone should expect, is that if the power goes out it could stay out for as long as one to two weeks. That will cause us a lot of problems with communication and transportation will be a problem because we’ll have lots of down trees, downed power lines so we should expect not to be able to drive anywhere for days, if not for a week or two. Lessons learned from hurricanes Andrew, Sandy and Katrina, and how Harvey compares. Are we seeing the same mistakes repeated? I think that hurricanes we’ve seen in the past, specifically Andrew in Florida, have led to stronger building codes; I think we have buildings that are much better constructed. That being said, this is likely the most powerful hurricane on record so the impacts are going to felt hard across the state. I don’t think there is any amount of preparedness that could get us absolutely ready for a storm like this. The biggest thing is to be prepared have food, have a good shelter and plan. Remember: run from water, hide from winds. that means find a good interior place in your domicile, in your apartment or house to take shelter from those winds; a place without windows that you could be protected from the storm. How will the impacts of Harvey compare with the impact of Irma? I think what happened with Harvey was catastrophic in that the storm did not pass through, it wavered and then stayed and circled back. I think what we’ll see here is the storm passing through relatively quickly. We won’t see a lot of standing water for days and days and days which caused that problem specifically in the Houston area. Of course, whenever you lose electricity, and systems that are cooling systems that are meant to maintain specific temperatures, we’ll often see problems if that power stays out for days. Stick with @UCFKnightNews for all of your UCF hurricane-related information.